BREAKING: Man Steps Forward w/Sexual Assault Allegations against Cory Booker. Hey Oliver, Why don't you push to investigate @CoryBooker sexually assaulting a gay man. @RonanFarrow Hey, Ronan, when are you going to investigate Corey Booker's alleged assault on a gay man? Is MeToo full of hypocritical operatives of the DNC? @SenFeinstein as a gay man I cannot wait to see you investigate @CoryBooker for this. It’s not only women that are sexually abused. And your pet #Spartacus guy looks guilty to me. Isn’t that the game now. Guilty til proven innocent????? While Booker deserves the presumption of innocence, he has admitted to committing sexual assault in the past. There are rumors surrounding his sexuality. He has also abused power as a Senator in the past. While I’m holding out for more evidence, the accuser’s claim is plausible. So, if we are using the standard set by Democrats, we should see a mob of angry gay men shrieking outside the office of Cory Booker demanding he resign, pending an FBI investigation. Bad news is hitting for possible 2020 presidential candidate and current Democratic Sen. Corey Booker — and it could be making hypocrites of his entire party in the process. An accusation has been made via Twitter that “Spartacus” — as the New Jersey senator infamously referred to himself during Supreme Court Justice Brett Kavanaugh’s confirmation battle — sexually assaulted a gay man. 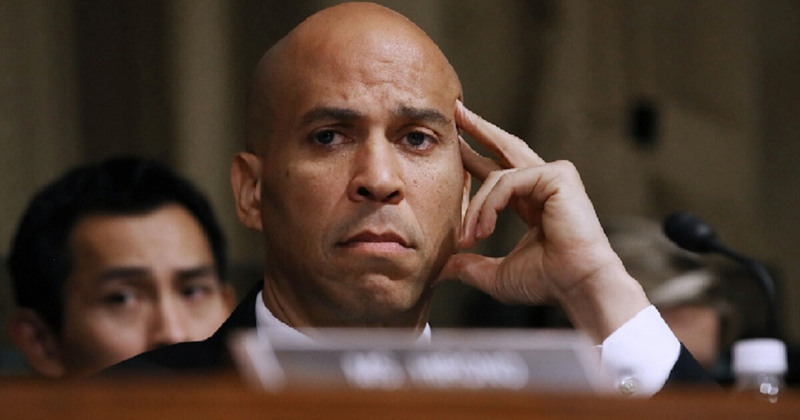 The gist of the story is that Booker, who has admitted sexually groping a female friend in high school, sexually assaulted the man in a restroom after the alleged victim complimented him. The alleged victim’s account, published online, is lengthy and was shared with an attorney. According to the man’s story, the alleged incident occured in 2014 and the victim claims to be a liberal who was a Democrat at the time. Do you believe the accusation against Sen. Corey Booker should be investigated? While he wrote that he has gone through rough times since the alleged incident, — “Fast forward 2 jobs, 3 therapists and one suicide attempt later to the latter half of last month” — he wrote that Booker’s behavior during the Kavanaugh hearings convinced him to speak out. “Watching Mr. Booker’s histrionic defense of the alleged sexual assault victim was so laughably ironic, so jarringly cringeworthy, and so triggering that it put me into a state of depressed rumination,” he wrote. He made contact with a lawyer — Harmeet Dhillon of the Dillon Law Group, the high-profile Republican attorney and a member of the Republican National Committee.